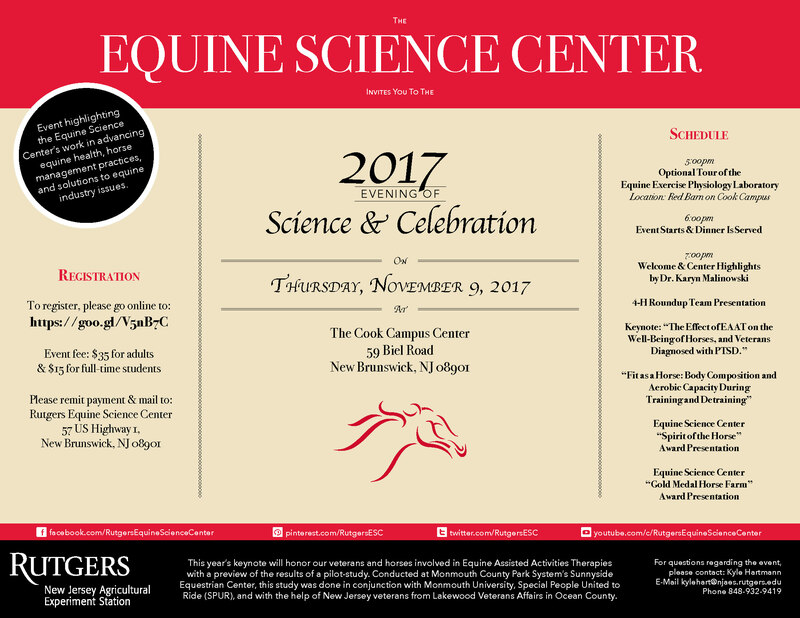 New Brunswick, N.J. – The Rutgers Equine Science Center will host its 2017 “Evening of Science & Celebration” on Thursday, November 9 from 6:00 – 9:30 pm at the Cook Campus Center in New Brunswick, NJ. This year, Karyn Malinowski, Ph.D. will deliver the keynote presentation on a pilot study that took place in April 2016 at Monmouth County Park System’s Sunnyside Equestrian Center. The five-day data collection trial used Equine Assisted Activities Therapy (EAAT) to measure the physiological indicators of stress and well-being in humans and horses. The sample collection was completed with a follow up standing control that was conducted using the same horses on June 5, 2016 without EAAT interaction taking place. Titled “The Effect of EAAT on the Well-Being of Horses, and Veterans Diagnosed with PTSD”, the keynote will focus on preliminary findings that will be published later this year or early next spring. Malinowski is a Professor of Animal Sciences, and the Founding Director of the Equine Science Center at the New Jersey Agricultural Experiment Station (NJAES), at Rutgers University. Her research and extension programs concentrate on improving the well-being and quality of life of the equine athlete while ensuring the vitality and viability of the equine industry, both statewide and nationally. The Center will present its annual Gold Medal Horse Farm award to the Dorsett family from Dorsett Farms in Woolwich Township, NJ. The award, part of the New Jersey Equine Environmental Stewardship Program, gives recognition to outstanding equine farms for their dedication to environmental sustainability and management. Additional presentations scheduled will include highlights of Center activity over the last year, and a presentation by current graduate student Dylan Klein titled “Fit as a Horse: Body Composition and Aerobic Capacity During Training and Detraining”. Prior to the beginning of the event, the Equine Science Center will present a demonstration of the high-speed equine exercise physiology treadmill at 5:00 pm at the “Red Barn” on College Farm Road. An “Evening of Science & Celebration” will begin promptly with dinner at 6:00 pm, followed by Brittany Smith from Somerset County 4-H, who will represent New Jersey at the National 4-H Roundup in Louisville, Kentucky on November 4th. Smith will give a presentation on the history of the Triple Crown races. The event requires registration that can be made online at: https://goo.gl/V5nB7C . The fee for the event, which includes dinner, is $35 for adults and $15 for full-time students. For additional information, please contact the Equine Science Center at 848-932-9419 or Kyle Hartmann at kylehart@njaes.rutgers.edu.